This delightful detached stone cottage features two bedrooms. The main bedroom has a double bed with fitted wardrobes and an ensuite bathroom with shower attachment over the bath. The second bedroom has 2 single beds, fitted cupboards and an ensuite shower room with hand basin and toilet. The living room and dining area is tastefully furnished with exposed wooden beams. It features sofa, TV, DVD, video player and stereo. There is also a separate seating area in the conservatory where it is nice to relax on sunny days. 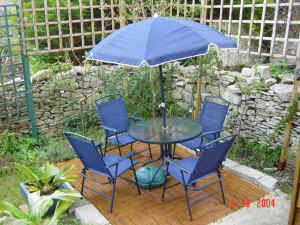 A garden table, chairs and loungers are provided in the garden. The kitchen is fully equipped with washing machine, cooker, fridge, freezer and microwave along with all the usual crockery and cutlery. There is no extra charge for electricity or heating. The cottage has central heating with a combination boiler, which provides instant hot water. There is also a gas fire in the living room. Linen is provided, but guests must bring their own towels. Although there is a yellow line outside of the cottage, there are spaces for 4 cars further down the road. If that fails there are plenty of spaces in the square, which is just around the corner. Portland itself can be reached over a causeway from the mainland and is therefore nearly an island. It is 4.5 miles long and 1.75 miles wide. Portland is most famous for it's stone, which was used on buildings such as St Pauls' Cathedral, and also for it's lighthouse. The nearest beach to the cottage is Chesil Beach which is 1 mile away and runs parallel to the strip of land connecting the island to the mainland. Portland Bill is also just 1 mile away and Weymouth is 4 miles. There are a selection of quality pubs and restaurants in Portland itself. The area boasts spectacular coastal views which makes it an ideal base for walkers and cyclists. Other possible activities include diving and sailing in Portland Harbour or horse riding along the coast. A few of the nearby tourist attractions include Portland Castle, which is well worth a visit, Sea World in Weymouth and Monkey World. 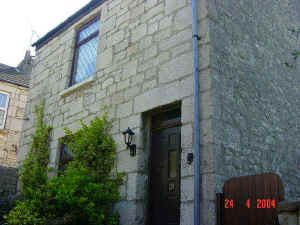 The cottage is within easy driving distance of Portland town centre. The nearest stables to the cottage is Windmill Stables in Weston (Tel: 01305 823719).